What makes us different? The Bax Team collectively has over 80 years experience in the business. With a high standard of art and a common interest in making your event awesome, we always deliver. Owner, Brian, has been entertaining in the area for 10+ years. His vision in creating this "Super Team" was to finally set a standard for delivering quality artwork, while simplifying the search for event planners all over town. 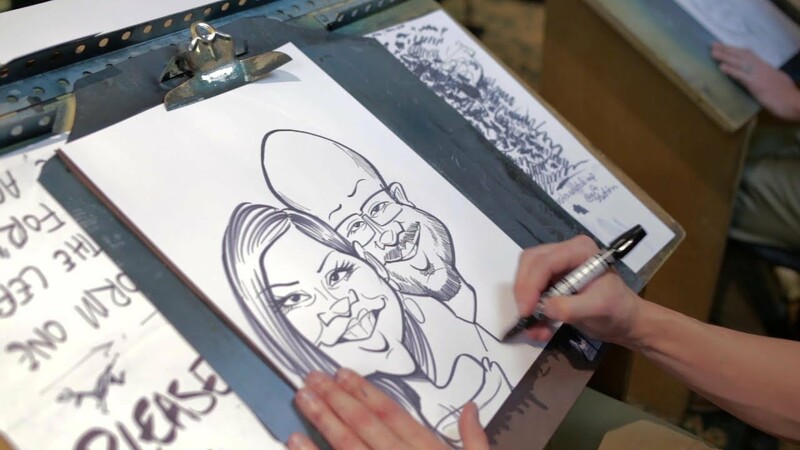 Caricatures are a lasting memory that your guests will actually hang on to. Are you looking for that "something" that will make your event a hit? 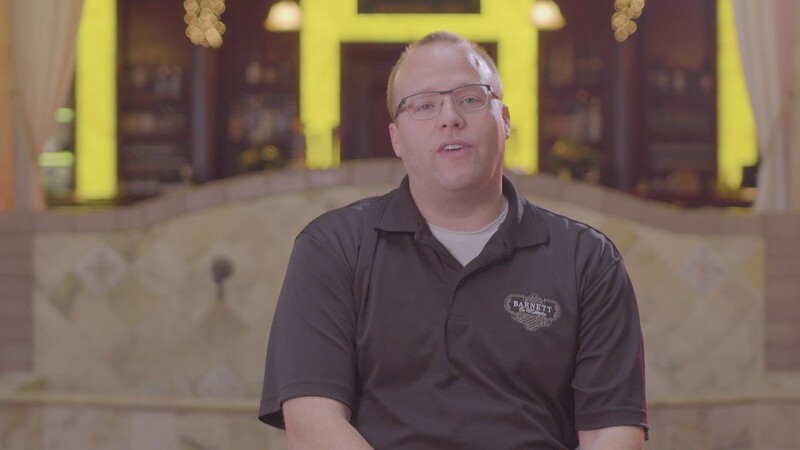 Let's get started planning your party. Ask about Event Perks! Brian is so professional, nice and accommodating! He stayed late when we ran over time and didn't complain one bit. He made our rehearsal dinner a hit and it's something everyone can keep to remember that week! I had a great time celebrating with you and Jim! Thanks a million for having me!! This is our 2nd year having Bax Illustration doing caricatures for our STL Scleroderma Walk. They do great work and our families love the pictures! We hired Bax Illustrations for our daughters 1st birthday party. He was very professional and was great with all the kids. Everybody loved his pictures and was the main attraction (other than the birthday girl!) He arrived early and even stayed a little late to make sure everbody got the picture drawn. He was very easy to work with and I would hire him again for our next party. Wonderful pictures with such great personality! It was awesome to have Brian at our charity event! Everyone had such a great time getting their pictures!!! So much fun and can't wait to have him back next year! Brian at Bax Illustration was the hit of our all night party. This is the second year we have used his services, and not only was he flexible with the event schedule, he went out of his way to make sure everyone had a good time. His caricatures are fun and well done- everyone was raving about them. I would highly suggest using him for any party! Brian did an amazing job, everyone had so much fun. Thanks for everything!! Awesome addition to a party! Bax Illustration was a great addition to my 10th annual Christmas party. Prompt, easy to work with, everyone loved them. I would totally recommend him! Bax Illustration did an outstanding job at our memorial picnic in August. Not only were the drawings a hit with picnic goers, but he kept the participants entertained as well. I would highly recommend this company and will keep you in mind for future events. We were so impressed with Bax Illustration at our event. Once we decided on the details, I did not have to worry about another thing regarding this aspect of our expo booth. I was even able to provide him with a theme for the expo and we incorporated that into the drawings! They were on time, professional, and talented. People all around the expo were talking about the artist we had as part of our booth. Whenever I need an artist for another event, I will be contacting Bax Illustration again! Brian and his crew are the best in Illustration! Brian has been a part of a major firm event for our clients called Winter Wonderland. 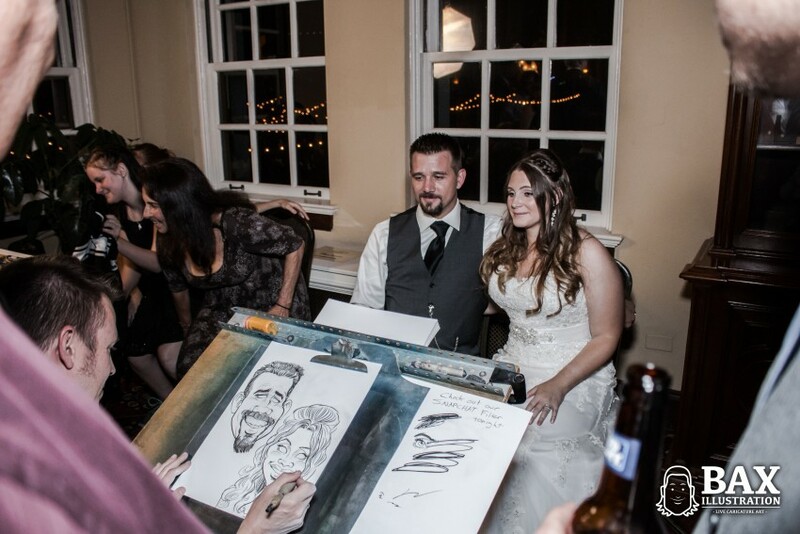 We have a big celebration with our clients and staff, and Brian provides the great caricaturists for our clients. Each year the clients are excited to get a different caricaturist. Brian is part of what makes our Winter Wonderland a success! Mr. Bax came to our daughters wedding reception and amazed everyone with his drawings! He even stayed later than he was scheduled to so he could finish the long line. I would recommend him over and over. Bax Illistrations did a fantastic job at our annual neighborhood party! 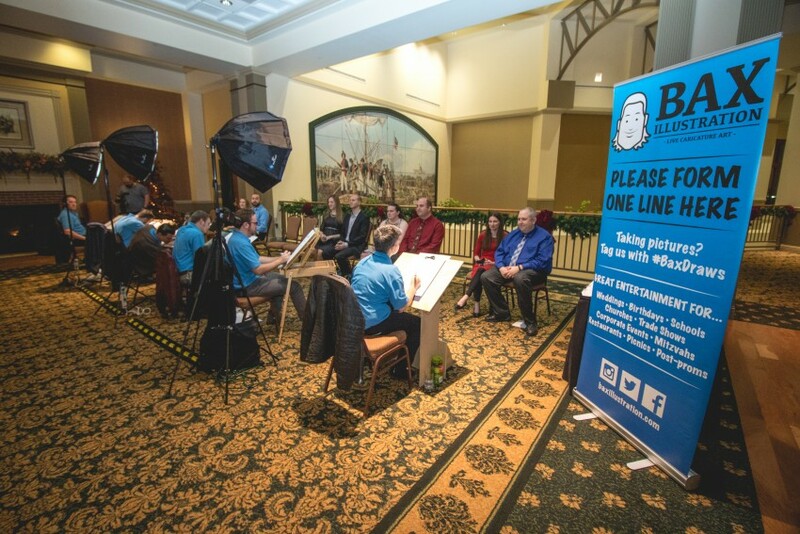 The caricatures drawn by Nathan were a highlight of the event. Next year we'll be booking them again! Not only were the drawings amazing but bax himself was so much fun! Everyone had a blast getting their caricature done and getting to chat with bax! It's a memory I'll have forever from my rehearsal dinner and was an awesome addition to the rehearsal dinner! Everyone loved it!!! I can't wait to use them again sometime in the future! My picture looks amazing on my wall! Very nice guy and wonderful to work with. I think everyone at our Fall Fest enjoy having a caricature artist there! Thanks so much Jayme! What a fun event. Our clients prefer B&W drawings because we are able to entertain more of your guests. Full color and themed drawings are great for Gifts. Yes, we have a Gift Illustration department, too. Look through our photos for the beautiful, colored caricatures. We spend a little extra time on these! Bax artists draw approximately 15 people per hour. I'm sure you are scratching your head right now wondering why we don't draw 20-30/hour like the other guys. Yes, we can draw that fast, but choose not to. Our clients like us because we focus more on likeness and quality than being the "Fastest" artist in town. At the end of the day, if it doesn't resemble you or your child, you won't be happy. Besides, 15 people per hour is still quite impressive! We all survived numerous hot summers at Six Flags St. Louis to start our journey's in the Caricature Business. The blacktop was sizzling, the days were long and our fingers were blistered from drawing endless lines of people. It was a college job for most of us, but the training was a game changer. Who would have guessed that this passion, this college job, could turn into a career. My name is Brian Bax. All of the guys and gals that make up this team are tusted, talented friends that I have years of experience with. We all were lucky enough to have gotten the best training available for caricature illustration. I hand-picked this team because of their skills, personality, professionalism and passion for making events awesome. Here at Bax Illustration, our goal is simplifying the process of finding and booking artists for your event. All we need is a place to set up at your event! Kick your feet up and relax! We've got it covered.